The QDesignerContainerExtension class allows you to add pages to a custom multi-page container in Qt Designer's workspace. QDesignerContainerExtension provide an interface for creating custom container extensions. A container extension consists of a collection of functions that Qt Designer needs to manage a multi-page container plugin, and a list of the container's pages. Warning: This is not an extension for container plugins in general, only custom multi-page containers. Since we are implementing an interface, we must ensure that it's made known to the meta object system using the Q_INTERFACES() macro. This enables Qt Designer to use the qobject_cast() function to query for supported interfaces using nothing but a QObject pointer. You must reimplement several functions to enable Qt Designer to manage a custom multi-page container widget: Qt Designer uses count() to keep track of the number pages in your container, widget() to return the page at a given index in the list of the container's pages, and currentIndex() to return the list index of the selected page. Qt Designer uses the addWidget() function to add a given page to the container, expecting it to be appended to the list of pages, while it expects the insertWidget() function to add a given page to the container by inserting it at a given index. In Qt Designer the extensions are not created until they are required. For that reason you must also create a QExtensionFactory, i.e a class that is able to make an instance of your extension, and register it using Qt Designer's extension manager. When a container extension is required, Qt Designer's extension manager will run through all its registered factories calling QExtensionFactory::createExtension() for each until the first one that is able to create a container extension, is found. This factory will then create the extension for the plugin. For a complete example using the QDesignerContainerExtension class, see the Container Extension example. 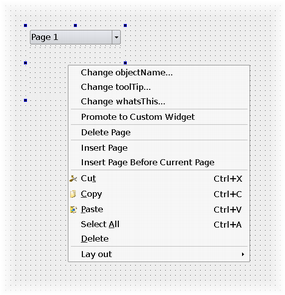 The example shows how to create a custom multi-page plugin for Qt Designer. Adds the given page to the container by appending it to the extension's list of pages. See also insertWidget(), remove(), and widget(). Returns the number of pages in the container. Returns the index of the currently selected page in the container. Adds the given page to the container by inserting it at the given index in the extension's list of pages. See also addWidget(), remove(), and widget(). Removes the page at the given index from the extension's list of pages. Sets the the currently selected page in the container to be the page at the given index in the extension's list of pages. Returns the page at the given index in the extension's list of pages.